Anorexia nervosa (AN) is a severe psychiatric disorder with high rates of morbidity and mortality. An estimated 21 % of patients experience a chronic course despite treatment with the best available medications and behavioral therapies. 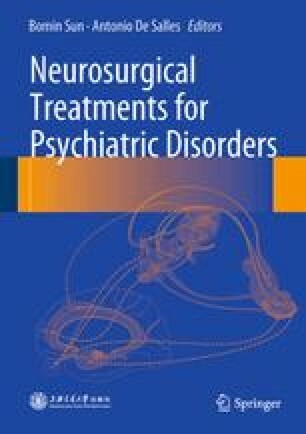 Existing data suggest that lesioning and deep brain stimulation can benefit a large proportion (ranging from 60 to 80 %) of patients with medically intractable AN. Long-term serious adverse events are very infrequent. Functional neuroimaging studies have increased our understanding of the mechanisms of disease development and therapeutic action. At our institution, we grade AN on a four-point scale based on patient clinical characteristics and our surgical experience over the past 8 years. This scale is particularly useful for guiding the selection of surgical procedures. Such treatment options include deep brain stimulation or lesioning of the nucleus accumbens , anterior capsulotomy, and anterior cingulotomy. Data suggest that surgical treatment is a viable option for intractable AN, and can alleviate suffering and improve the quality of life of patients with these disabling disorders.